One of the great pleasures of academic writing is being able to acknowledge students and blog readers who help you see things you’d have missed. The posted image is from p. 304 of Votes from Seats. The footnotes here refer to a current graduate student in our department and a regular reader/commenter on this blog. Awful, eh? I mean, in particular, the aftermath. It seems we are watching the consolidation of a potentially totalitarian state. Well, this is depressing. The Turkish AKP party apparently has regained the parliamentary majority in today’s general election, the second in the country this year. While the Guardian calls it a “surprise“, I don’t think so. President Recep Tayyip Erdogan presumably knew what he was doing when he refused to go into coalition following the results of the June election, and let parliament be dissolved instead. With 95% of votes counted, the AKP won almost 50% of all votes, according to the state news agency Anadolu. The main opposition Republican People’s party (CHP) stood at 25.2 percent, smashing all possibilities of a coalition government. The HDP scraped over the unusually high threshold of 10% with 10.6 percent of all votes, down from 13% in the 7 June election. At least the parliamentary majority is not due to exclusion of the HDP. Both Greece and Turkey had notable elections earlier in 2015: Greece in January, when SYRIZA (the Coalition of the Radical Left) came to power; Turkey in June, when the AKP (Justice and Development Party) fell short of a majority and the HDP (Peoples’ Democratic party, which has much Kurdish support) cleared the country’s 10% threshold for the first time. Now, both are going back to the polls before the year is out, meaning we will have elections “2015a” and “2015b” for both countries. Greece is no stranger to early elections, but I believe this will be a first for Turkey. In Greece, once PM Alexis Tsipras completed the passage of the measures required to secure new EU loan guarantees (the third “bailout”), he resigned, triggering early elections. He passed the measures with the help of the opposition parties, given the negative votes from within SYRIZA. The drachma nostalgist splinter from SYRIZA will contest the 20 September election as Popular Unity. In Turkey, no agreement was reached on any of the possible coalition (or minority government) options, and so an election was called. The new election will be 1 November. The nature of the countries’ electoral laws will make these worth watching. * Under Greek law, a second election within 18 months of an earlier one is under a different list format. Normally, Greek party lists are mostly open (there are provisions to ensure safe seats for party leaders). In case of a new election within a year and half, the lists are closed. 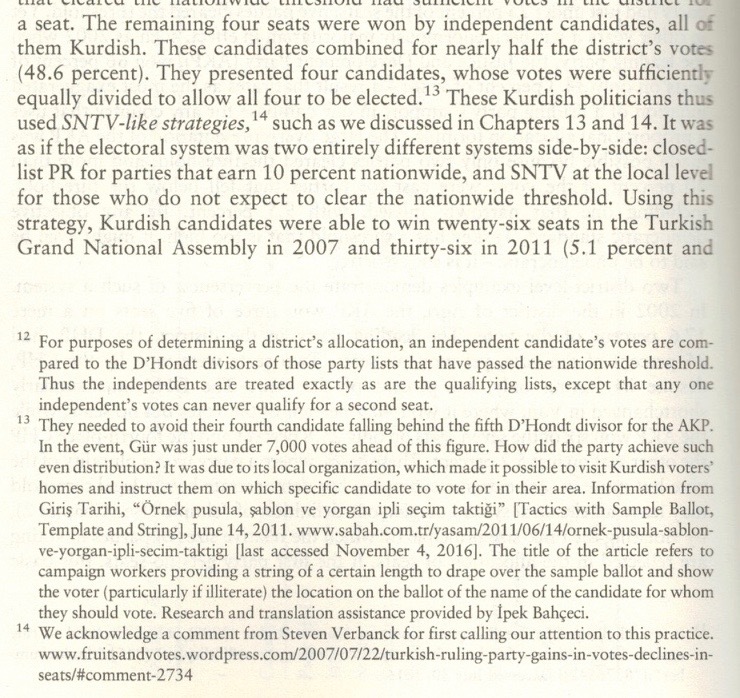 In the Turkish case, the Kurdish political organizations prior to 2015 had avoided the risk that the high nationwide threshold would exclude them entirely (were they to run lists) by running their candidates as independents. They actually became quite good at it–sometimes even electing two or more candidates per district through effective vote-management strategies. In other words, to the Kurdish political forces, the system was effectively single non-transferable vote: elect individuals by ensuring your votes are efficiently divided. For an example, see Van in 2011, with a district magnitude of 7: Three seats for the AKP on 40% of the vote, and four independents with individual vote totals ranging from 9.7% to 15.4% (48.7% combined). In the June election, the HDP, consolidating Kurdish and left-liberal opposition forces, won 13.1% of the vote. It thus cleared the threshold fairly easily. If they break 10% again, it is hard to see how the government-formation process will be any easier. Or perhaps the AKP counting on its recent resumption of its crackdown on Kurdish separatism attracting hardline votes that will get it back over half of parliament. * I know, I know. I always say that. ** SYRIZA’s coalition partner, Independent Greeks, is polling very close to the 3% threshold. It won 4.75% in January.